Stunning deep blue druzy stone, the colour of the sea with glimpses of sunshine. 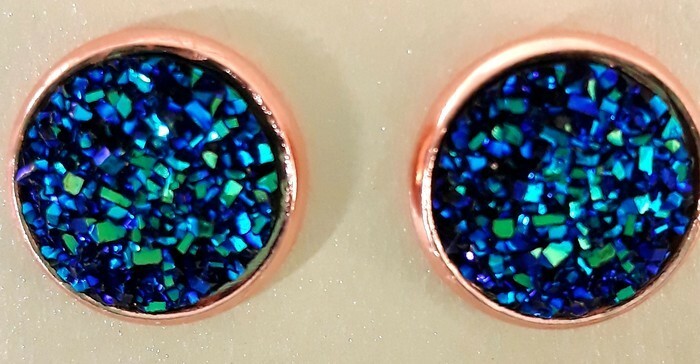 12mm stone , made from glass and resin set in your choice of rose gold, bright gold or platinum bezel (leave us a note at checkout). Stainless surgical steel post. These little studs work with everything, dressy to your denim casual. See how many compliments you get wearing these little beauties. Please use our PayPal site or direct deposit details. You can elect to pay with your credit card, once you enter the PayPal portal. Process through Visa or Mastercard. Please provide your name and the item code with your direct deposit payment. Thank you for purchasing from Ruby & June.